It’s been rumored that Einstein said the most powerful force is compounding [interest]. Simply put, compound interest is interest calculated on not only your initial principal but on any accumulated interest as well. Jack invests $10,000 and earns 7% interest per year. Year 1: Starting amount = $10,000. Interest =.07 * 10,000 = $700. New balance = $10,700. Year 2: Starting amount = $10,700. Interest = .07 * 10700 = $749. New balance = $11,449. Notice that in year 2 that you earned $49 more in interest than in the first year. This is because you earned interest on top of the interest that you had already earned. The extra $700 produced in the first year earned you that extra $49. This amount just keeps increasing with compound interest. 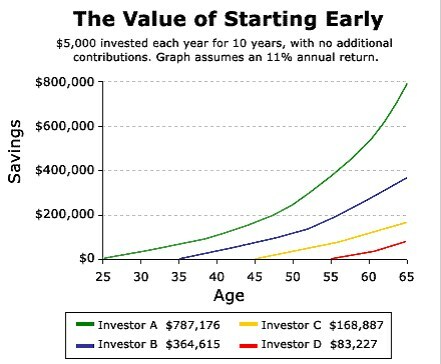 The most important thing you can do is to start early. The effects of compounding money an extra 10 years can be life-changing! This is just an example, an 11% return over 30 years is almost unheard of unless you invested in a company like Altria Group (MO) that spun off companies like Philip Morris (PM) and Kraft (KFT). Then Kraft (KFT) spun off Mondelez (MDLZ) in 2012. However, this makes the point I’m trying to get across. There’s a vast difference in the amount of money that has compounded over a 40 year period compared to starting later in life. Investor A has $787,176 when investing only $5k per year! Yes, almost anyone can come up with $100/week to invest. Starting just 10 years later at age 35 drops your entire ending balance by more than 50%! You still had 30 years of compounding but that extra 10 years more than doubled your final outcome. It’s simple reminders like these that keep us on the right track. Your son is very lucky to have a mentor showing him how to start investing. I wish I had the knowledge I do now when I was younger. I look forward to reading that article. Sadly I started investing at a fairly young age but had no patience and certainly wasn’t buying the safe blue-chip companies. I was looking to make a quick buck on the next hottest stock. I’m now paying for those investing mistakes. Time is certainly a major factor of investment success and as you mention, it can still make up for some earlier mistakes. Luckily time is still on our side. There’s no doubt the the concept of compound interest is lost on most people. If this simple concept was taught in earnest in high school with graphs and charts showing what a long term result can look like I think we’d have many more financially better off people. The problem with compound interest is that it takes several years for the real mojo to kick in and have exponential growth. I totally agree with you. It’s amazing to me the small amount of important put on finance and economics classes in high school. It does take some time to really start seeing the effects. That’s one thing that can keep you from sticking to your plan early on. If you know the concept and have seen the numbers then it definitely helps confirm you are on the right track.